If you booked your Caribbean yacht vacation to escape the cold and dark of January at home but indulged a little too much over the party season, chances are you're probably not feeling quite beach-ready at the moment. There's nothing like the chance to relax in a tropical destination on your own superyacht but hectic post-Christmas schedules can leave you with little time to prepare. Leading nutritionists and trainers give Lucia Berni the lowdown on looking brilliant in the best bikinis – even when you have less than a week to go. Nutrition David Kirsch, who has trained yacht-loving models Kate Upton, and Heidi Klum, recommends “eating five meals between 7am and 7pm as this will help speed up your metabolism”. Aim for breakfast, lunch and dinner with a snack morning and afternoon. A protein shake or handful of almonds with lean protein will work as one of the snacks. Nutritionist Ian Marber suggests “a low-carb, high protein diet for five days, though it’s not good to stick to this long term. Choose as many green vegetables as possible (less sugar)”. Trainer and author James Duigan, who has trained Elle Macpherson and Rosie Huntington-Whiteley, reminds us: “Avoid alcohol. It’s your worst enemy when you are trying to get into shape and just makes you sluggish and bloated.” Remember to snack wisely. Duigan advises turkey slices, nuts or blueberries. If you booked your Caribbean yacht vacation to escape the cold and dark of January at home but indulged a little too much over the party season, chances are you're probably not feeling quite beach-ready at the moment. There's nothing like the chance to relax in a tropical destination on your own superyacht but hectic post-Christmas schedules can leave you with little time to prepare. Leading nutritionists and trainers give Lucia Berni the lowdown on looking brilliant in the best bikinis – even when you have less than a week to go. David Kirsch, who has trained yacht-loving models Kate Upton, and Heidi Klum, recommends “eating five meals between 7am and 7pm as this will help speed up your metabolism”. Aim for breakfast, lunch and dinner with a snack morning and afternoon. A protein shake or handful of almonds with lean protein will work as one of the snacks. Nutritionist Ian Marber suggests “a low-carb, high protein diet for five days, though it’s not good to stick to this long term. Choose as many green vegetables as possible (less sugar)”. Trainer and author James Duigan, who has trained Elle Macpherson and Rosie Huntington-Whiteley, reminds us: “Avoid alcohol. It’s your worst enemy when you are trying to get into shape and just makes you sluggish and bloated.” Remember to snack wisely. Duigan advises turkey slices, nuts or blueberries. Josh Wood Atelier’s Dress Size Downsize (£85) is a 90-minute body massage and mask, which is popular because it does what it says: a temporary loss of a few centimetres on waist, hips and thighs. It’s a combination of sea salt and essential oil exfoliation followed by a heated body wrap and then a very cold algae body mask that peels off to reveal Jessica Alba-soft skin and smoother, slimmer thighs. Epsom Salts have been used for years by models before photo-shoots. The salts are full of magnesium and encourage the body to shed toxins quickly and may boost digestion. Pour two capfuls into a hot bath and soak for at least 20 minutes three times a week. Dry body brushing makes legs, upper arms and tummy appear more toned. It helps with lymphatic drainage, exfoliates and makes everything look smoother. The Mio Body Brush (£14.50) has tiny massage nodules; follow with a toning body oil. 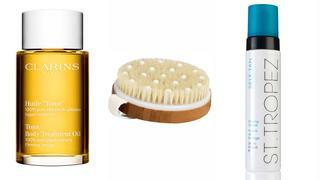 Clarins Tonic Body Treatment Oil (£40) is one of its best sellers. Finally, a good fake tan can make you look – and feel – pounds lighter. Our favourite is St Tropez Self Tan Express Advanced Bronzing Mousse (£33). Epsom Salts have been used for years by models before photo-shoots. The salts are full of magnesium and encourage the body to shed toxins quickly and may boost digestion. Pour two capfuls into a hot bath and soak for at least 20 minutes three times a week. Dry body brushing makes legs, upper arms and tummy appear more toned. It helps with lymphatic drainage, exfoliates and makes everything look smoother. The Mio Body Brush (£14.50) has tiny massage nodules; follow with a toning body oil. Clarins Tonic Body Treatment Oil (£40) is one of its best sellers. Finally, a good fake tan can make you look – and feel – pounds lighter. Our favourite is St Tropez Self Tan Express Advanced Bronzing Mousse (£33).